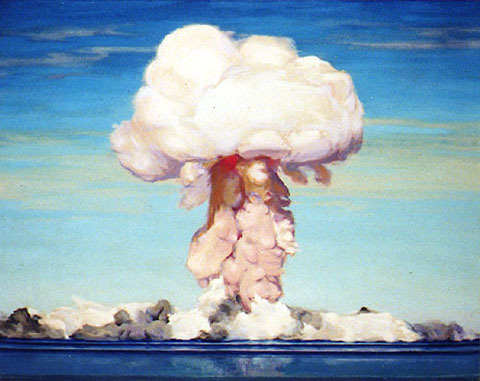 for more images from Bikini Atoll bomb testing. Look around. Check the beaches for shells. Take a close look at the reefs. Talk to commercial fishermen. If you have been reading accounts on planetary health you probably know it already. The oceans are dying. It is a big deal not only for us in Hawaii, but for all life on earth. Over the last generation, almost 90% of the large food fish have been strip-mined from the seas. Vast tracks of the ocean north of Hawaii are clogged with floating plastic garbage from the mainland USA and Asia. Even a minor rise in ocean temperature will devastate what is left of the planets delicate reef systems. The US Navy is the most powerful instrument of destruction in the world. In the face of the collapse of the world economy in the coming energy crisis; in the face of the emerging disaster of chaotic climate change; in the face of the overburdening of the planet's capacity to sustain our numbers... shouldn't the Navy reassign its priorities? Instead of adding to its burdens, shouldn't the Navy make whatever attempt it can do save the world's oceans? That our senior naval personnel could propose expanding the death and destruction of life on this planet, at this critical time, hardly seems credible. Don't they not know what is at stake? The real enemy is not a potential ballistic missile 2000 miles downrange, it is the death of the planet. It is time for the Navy to cease and desist its deadly operations in the Pacific. Stop trying to turn Hawaii into Mordor. Instead, take this Draft EIS and head back to San Diego and Washington DC. Face the real enemy! Go back to the drawing boards and come up with a new strategy that responds to our actual predicament and addresses the real foundations of global security - support and restore ocean vitality. Address our future and stop shadow boxing with fears and phantoms of the past. Our lives depend on it. Ecologically, we are past a turning point. There are fewer options before us and little tolerance for bad judgment. We have to get plans right this time because there won't be another. This applies to the Navy's proposed plans for the future of Hawaii. To date, the Navy has had an abysmal history regarding the treatment of islands throughout the world's oceans. And we are talking about the treatment of our allies, not our enemies. After World War Two the native Micronesian population was removed from the islands of Bikini Atoll by the Navy. 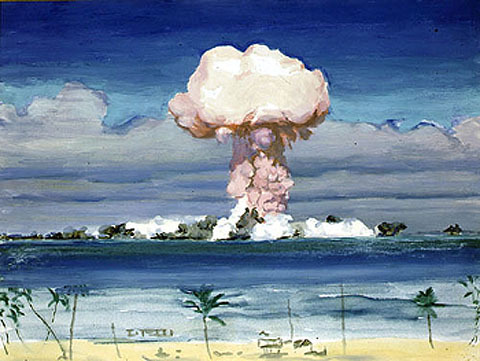 Between 1946 and 1958, as part of the Pacific Proving Grounds, the islands of the atoll were the site of more than twenty nuclear weapons tests. 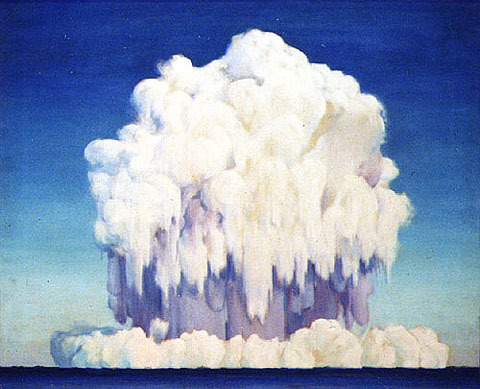 Beginning in 1952 the tests included the atmospheric and submersed detonation of hydrogen bombs. In 1968 the US Navy declared Bikini Island habitable and started bringing Bikinians back to their homes. In 1978, however, the islanders had to be removed again when strontium-90 in their bodies reached life threatening levels. The failed attempted cleanups have cost hundred of millions of dollars. During World War II, the Navy purchased about two thirds of Vieques Island (a part of the territory of Puerto Pico). Many residents, who had no title to the land they occupied, were evicted. After the war, the Navy used Vieques as a firing range and testing ground for bombs, missiles, and other weapons. It was the most important Atlantic Ocean range facility for the US and NATO. The continuing post-war "occupation" drew protests from the local community angry about environmental impact of weapons testing. Protests came to a head in 1999 when island native was killed by a bomb dropped during a target practice. A campaign of civil disobedience began. As a result, in 2003, the Navy reluctantly withdrew from Vieques. Here in Hawaii we have faced military occupations as well. After the attack on Pearl Harbor, the U.S. Army declared martial law throughout Hawaii and took control of Kahoolawe Island. For six decades, under Navy oversight, thousands of tons of ordinance bombarded the island in training exercises. In 1994, after decades of pressure from Hawaiian groups, the Navy agreed to transfer title of Kahoolawe to the State of Hawaii. Although the Navy spent $400 million and ten years on a a required cleanup, uncounted unexploded bombs and shells still remain on the island. Many items have washed down gullies and still others lie underwater offshore. The Navy turnover was completed in 2003, but the cleanup was never finished, leaving Kahoolawe a deadly and toxic landscape to this day. As part of the world's only "Super Power", the Hawaiian Islands are the strategic center of US military operations in the Pacific Ocean. Hawaii is the command and control hub for an area covering almost half of the world. Pearl Harbor may be the center of attention, but Kauai island plays an important role as the command backup for Pearl and as the tracking, sensing and communication coordinator for activity throughout the Pacific Ocean. On Kauai, the nerve center is the Pacific Missile Range Facility (PMRF) and it is crucial to the operation of the Navy's Hawaii Range Complex (HRC) covering over two-and-a-half million square miles. The Navy is proposing a major upgrading and expansion of the Hawaii Range Complex. This is in order to do more research, development, testing and evaluation (RDT&E) of military systems and weapons. The HRC is the largest and most elaborate weapons range in the world, and we are at the center of it. With the upgraded range the Navy has planned over one-hundred-and-forty RDT&E projects. Many are for the development of new weapons systems like Antisubmarine Warfare, Advanced Hypersonic Weapons, Missile Defense, Electronic Warfare and Directed Energy Lasers. Many of these programs will be run from the PMRF. Three that are of great concern to me. The Navy says that the increased tempo and frequency of training operations includes as many as five-thousand hours of mid-frequency active tactical sonar and the associated DICASS sonobuoy, MK-48 torpedo, and dipping sonar. 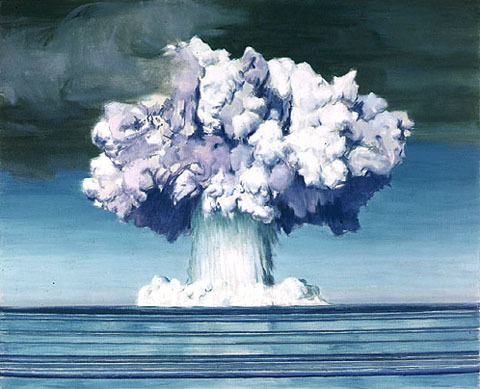 Underwater detonations are possible during several programs. All this will destroy uncountable numbers fish and sea mammals. There is little mitigation that can be done when these systems are used. In its EIS the Navy says that before Expeditionary Assault Activities landing routes and beach areas will be surveyed for the presence of sensitive wildlife. An exercise will be halted if marine mammals are detected on the target area. The operation will foster the reestablishment of native vegetation. What it really sounds like the Expeditionary Assault will tear up the beaches and dunes between Poli Hale and Barking Sands. This is literally an assault directly on Kauai. Worse is the Directed Energy Laser Weapons Program. These are chemical lasers in which use hydrogen fluoride, a corrosive material which can be made to release a powerful burst of infrared radiation. The laser can be focused and aimed as a weapon (death ray). These laser can generate least 25 megawatts of energy that could destroy a missile 2,000 miles away. For the scale of this realize 25megawatts is half the electrical power generating capacity of Kauai. The firing of this weapon also destroys the lasing device and contaminates its site with hydrogen fluoride. A thousand foot radius danger zone, that could close the state park, will persist for days. The Navy has not told us what effect on the environment hydrogen fluoride waste will have. What if there is a heavy rain and runoff after a test? What effect on coral reefs and offshore marine life would there be from hydrogen fluoride contaminated runoff into the ocean? What efforts will guarantee the safety of people using the access road to Poli Hale State Park after a test? In its Navy's EIS executive summary it simply says, "Appropriate remedial procedures would be taken before initiation of potentially hazardous laser operations on PMRF". That's it?!! That is unacceptable.